Today America's nonprofit sector, long a critically important part of the nation's social and economic fabric, is more important than ever. Economic woes and cutbacks in public services have put additional burdens squarely on the nonprofit sector's shoulders, exacerbating the sector's longstanding "conflicting multiple identities" as not-for-profit organizations operating in a for-profit market economy, relying heavily on volunteers but expected to meet often-exacting professional standards --part of the private sector yet serving public purposes. 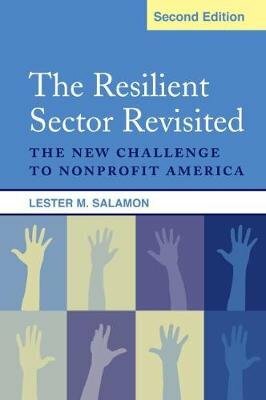 As Lester Salamon explains in his second edition of "The Resilient Sector," America's nonprofit organizations are caught in a force field, buffeted by four rather different impulses --voluntarism, professionalism, civic activism, and commercialism --that are pulling it in rather different directions. Understanding this force field and the factors shaping its dynamics thus becomes essential to understanding the future of individual organizations and of the nonprofit sector as a whole. To date, far too little attention has been paid to these developing tensions. Salamon explains how and why they developed and how they interact with one another in the ongoing battle for the soul of America's nonprofits.